Duons helps businesses to manage and maintain their complex technology and assets, optimise infrastructure and reduce their total cost of ownership (TCO). With over a decade of experience as a service provider to major companies across a range of industries, this Australian company has developed an industry-leading approach to component testing, repairs, spares management and reverse logistics. With large-scale operations like mining and resource extraction, where maintenance constitutes a significant portion of overheads, Duons offers efficiencies that improve bottom-line performance. The company facilitates this in a number of ways: purchasing surplus components from companies for redeployment elsewhere, managing inventory and maintaining buffer stock so businesses can reduce their warehousing footprint, as well as utilising sophisticated analysis and reporting on equipment failure so maintenance can be managed more proactively. Past and present Duons clients include Telstra, Telecom NZ, Honeywell, Boeing, Orange, Telmex, ABB, FERM, and ASKO. Every aspect of Duons’ approach is designed to deliver maximum efficiency at minimum outlay, and to preserve the value of deployed technology. Even if a piece of equipment is beyond repair, it still contains many viable components, which can be recombined into a working model, sold to recoup part of the cost, or disposed of in a responsible manner. Diligent management of spares and repair work results in less downtime, easier diagnostics and repair work that actually increases system capabilities. PCBs are re-engineered to modern standards; the systems they are placed into improve in functionality and reliability. Duons offers purpose-designed modules from enterprise-grade components that consistently meet or beat the performance of the parts they replace, minimising the risk of future failures. Duons provides a spares management programme as an integral part of reducing the budgetary impact of equipment failures or breakdowns. With a stockpile of buffer products, it is possible to simply replace like-for-like without wasting time on prolonged diagnostics. Under this swap-in swap-out process, the damaged part is then returned to the Duons engineering centre, where it is analysed, repaired and/or upgraded accordingly. It is then re-used, minimising wastage and loss of value. Replacing entire infrastructure systems is both financially and environmentally costly. Alongside the responsible recycling of unfixable e-waste, the Duons approach to repurposing and upgrading existing systems is proven to reduce costs with no perceivable loss of performance. Keeping infrastructure that is competitively functional removes the necessity to purchase replacement systems and mitigates the environmental impact of manufacturing and installation. Duons distributes ServersCheck, a modular, scalable and affordable industrial internet of things (IoT) solution. The software enables operators to monitor, report, alert and control the technology infrastructure at mining sites. ServersCheck is not only used to monitor data centres and server rooms; its modular architecture makes it ideal for monitoring remote sites, such as communication rooms and high-voltage direct-current (HV DC) boxes. An automated solution offers great return-on-investment, maintaining optimal on-site operations with minimal demand for personnel. Technological infrastructure requires large investments, and when faced with the pressures of future obsolescence and product discontinuation it’s critical to have a plan in place to manage the end-of-life phase of technology. That’s one of the key areas where Duons can help. When technology gets superseded by newer products and support or spares for legacy equipment become unobtainable. Duons works with mining operations to help balance the demands of keeping technological infrastructure up-to-date and minimising costs. Repair and modernisation of existing assets is often much better value than outright replacement. By maximising the technology system’s effective operational lifespan and remaining proactively prepared for potential technical issues Duons ensures continued productivity, drive down OPEX and delay the need for significant CAPEX. 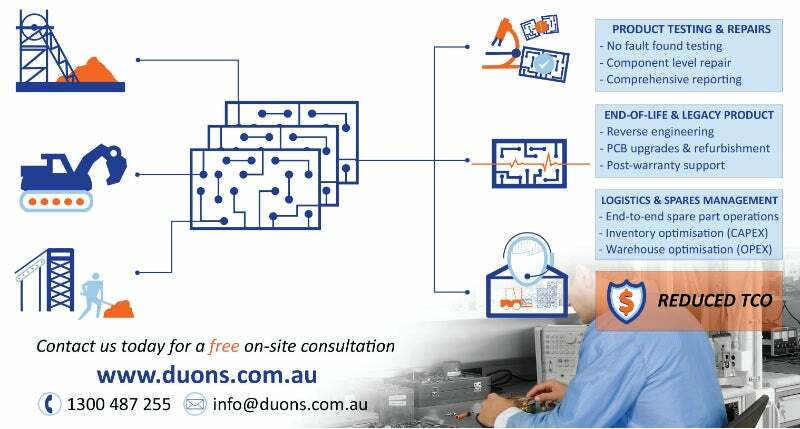 Contact Duons today for a no-cost, on-site consultation. Thanks to market-leading SR1000+ microwave radio technology, the cooperation of local government and business, as well as Duons’ expertise in network planning, integration and project management, the first phase of an extended network roll-out has proven successful. Many industrial and manufacturing businesses rely heavily on a single piece of machinery or factory equipment for their ongoing profitability.